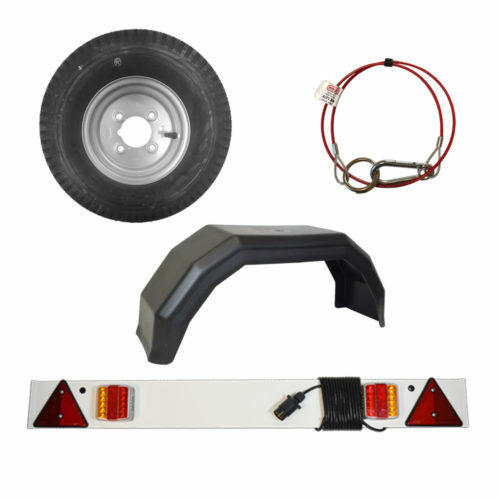 If you own or run any kind of trailer on the road it is always a good idea to keep some trailer parts handy ready for any unforeseen circumstance. With the large selection of trailer manufacturers and trailer parts available online it can be hard to find exactly what you need. If you cannot find what you require why not contact us, we may be able to source or have what you need in stock! It is always important to ensure you have the correct breakaway cable fitted to your trailer, it is designed to stop/slow down your trailer in the event of it becoming uncoupled. You can also receive a fine if you do not have one fitted if you are pulled for a safety check. It is always a good idea to keep a spare wheel with you whilst using your trailer as blow outs always seem to occur at the most inconvenient times! We stock 8″, 10″, 12″, 13″ & 16″ trailer wheels. One thing people seem to forget is to keep the tools to change a wheel and a jack for when a blow out happens, so make sure you have the tools for the job! Trailer mudguards are often over looked as a handy spare part because not everyone knows that it is a legal requirement to have your wheels covered whilst towing on the road in the UK. We stock a range of mudguards to suit many different trailers. From 8″ single mudguards to tandem 16″ mudguards. Lights on your trailer are a legal requirement so it is important to ensure they are working at all times. In case of a light failure whilst out on the road it is always handy to keep a lighting board to hand to ensure you can get home, as towing without lights can land you in some serious trouble not to mention being dangerous for yourself and other road users. Make sure you are legal with a free trailer safety check today at Graham Edwards trailers east of York at Full Sutton. A large range of trailer spares stocked for all your needs.